We are open & fully operational! ARE YOUR BRAKES MAKING NOISES? Accepting insurance vehicles & extended warranties! Hi Tech Automotive Offers Auto Repair Services You Can Count On! 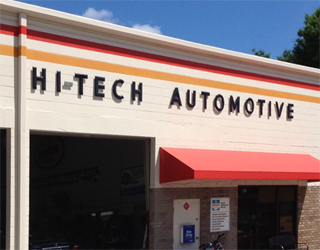 Since 2004, Hi Tech Automotive has provided motorists in the Brandon, FL 33511 area with comprehensive auto repair services that include Alignment, Brakes, Car & Truck Care, Domestic Cars & Trucks, Electrical Services, Electronic Services, Engine & Transmission, Engine Maintenance, General Services, Heating and Cooling Services, Import Cars & Trucks, Inspections and Emissions, Miscellaneous Services, Quick Lube Services, Tires, Transmission Services and Undercar Services. Our goal is to offer the best services available at affordable prices to get you back on the road in no time. For a high-performing vehicle, trust Hi Tech Automotive with your car, truck, or van. To learn more about the services we offer, please contact us by phone at 813-684-1556 or send us an email. We also invite you to learn more about our dedication to you, our valued customer. Fast and affordable service. My window was broken and they were able to diagnosis and fix the problem the same day. I will be going to Hi Tech Automotive again in the future. Very nice staff, honest work at a wonderful price. I will definitely be returning! It is very hard to find a quality repair shop in general, but to combine quality with integrity? Kudos to the hard working crew who always repairs my vehicles correctly, efficiently, and advising me when work is not necessary. Thanks Gary & Joe ! If you value honesty, competency, and fair prices, this is your mechanic. Seriously, go here for everything. You don't need to keep looking, I have had Hi Tech do all my work for 6 years on my 07 F 150 FX4. Every single time I get work done they do a great job at a fair price. I have had to have my truck towed to them twice and they didn't tack on money for the tow bill. This is the most honest shop around. Every time they delivered on their promise and keep me rolling. Won't trust my truck to anyone else. I've taken my van here twice and they've fixed it quickly and for less money than other places have wanted to charge me. No matter who I've dealt with I've had all my questions answered and have been treated respectfully. My fiance knows a bit about cars and decided to try them too. He was impressed with how honest and thorough they are. We won't be taking our vehicles anyplace else. I have taken my vehicle to them 3 different times now. Mostly for minor things. The first time they fixed the problem and charged me just for the cheap part. They are really honest and explain why they need to do what they need to do and they walk you through it. They have a lot of integrity and are proud of the work they do. It shows! Everyone I know who goes there has nothing but good things to say about them. Try them. You won't be disappointed. Great service at well respected auto shop! Got my car repaired and tuned up there multiple times. They are easy to work with, and nice people. Honest and professional, competent and reasonably priced. What else can be said? I have had four separate vehicles repaired here over the past 10 years, and I have no complaints. I went there the first time when they were recommended by AAA, Been going there ever since! I have been a HI Tech customer for the past 7 years. Joe, Gary and the gang have gone above and beyond helping me keep my vehicles safely on the road, Advising me what repairs where necessary and what repairs could wait. They have quickly returned me on the road so I could get back to work, despite the fact that the part they needed only arrived moments earlier. I could go on and on with stories about how amazing Hitech is. Needless to say HiTech has earned my family's business and we will be adding our soon to be 16 y/o daughter to their customer list! I wonder if they will bubble wrap a car? !